VIP gives you immediate access to any virtual instrument in your collection, with or without a DAW. It's a powerful way to play virtual instruments live or integrate them into a recording session. Kontakt is one of the most commonly used plugins, but because of it's unique structure, the process for using inside of VIP requires a little more explanation. This guide will walk through using the VIP Plugin Manager to activate expansions for Kontakt and other expansion based plugins. A lot of plugins contain expansions. In short, these are banks of additional content and presets that are not contained in the initial content provided with the plugin. They are usually provided separately as an additional installation or as part of a package, like Native Instruments' Komplete. For some plugins, like Native Instruments' Kontakt, these expansions represent most of the provided content and allow the user to customize their plugin content according to what they need by purchasing only the expansions they want. For others, like AIR Hybrid, an expansion is just an additional bank of presets and sounds (i.e. Mark Knight Deep House expansion, D.Ramirez Tech House expansion, etc.). No matter the use, the instructions below will apply to any plugin that contains additional expansions or add-ons that are separate from the plugins base content. Once you have opened VIP, navigate to the top of the window and select Settings > Plugin Manager. Once you have the folder selected, click Scan to scan the folders. If you have previously scanned your plugin folders and would like to do a full re-scan hold CTRL/CMD and click Scan. Remember: Expansions are not plugins and will not appear in the Plugin Manager, except as available plugin maps. As VIP scans your plugin folder you may see plugins request authorization if they have not yet been authorized. 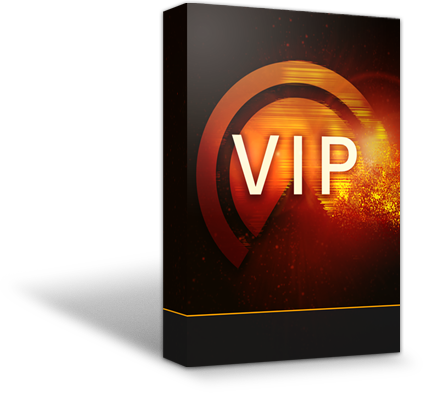 Please authorize all of your plugins properly to ensure the best performance in VIP. When the scanning process is complete, you will see Kontakt appear in the plugin list. You'll notice that after you have completed scanning for Kontakt, you will have three separate Kontakt options. All three versions are virtually the same, however, each one has a different amount of output channels: 8, 16 and 64. Because VIP also has 8 stereo audio outputs, you can still route your Kontakt outputs straight through VIP and to your DAW the same way you would with Kontakt in standalone. To avoid duplicating maps across different versions of the same plugin, it's best to only activate one of these according to what you may use the most. For more information on how to utilize the different outputs, take a look at the following link. 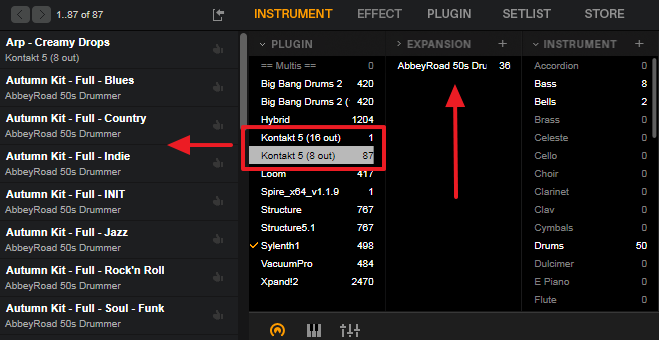 After selecting which VST you would like to use, click the arrow on the left to expand your Kontakt expansion list. This will show you a list of all available Kontakt expansion maps for VIP. Click the box next to the expansion map to activate the map and import it into VIP. In this example, I'm using the free Kontakt Player and included Kontakt Player Factory Library. In the image below, you'll see that I've found the expansion from the list and clicked on the box next to it to activate the map. The number on the left represents the amount of included patches or presets in the map. Please note: You should only activate the maps for expansions that have already been installed. Activating expansion maps that you do not have installed will result in empty patches in your library. If the map is in the list but appears with this icon next to it: this just means the map will need to be downloaded. Simply click on the icon and the map will download and activate itself upon completion. When you've activated the plugin maps, click OK in the bottom right corner and VIP will request to import the newly activated maps. As soon as a new map is available, it will appear in your Plugin Manager automatically. No additional downloads or updates necessary. If you have multiple expansions activated, use the Expansion column to sort your patch selection even further by selecting one or multiple expansions. * The factory preset expansion is built into Kontakt and thus does not register as an official expansion pack. As an example, I have also activated the Abbey Road 50's Drummer expansion bringing the total patch count to 87. You'll notice in the image above that the "16 Out" version of Kontakt only has one patch. This is an example of what Kontakt would look like without any expansions activated. The plugin can still be loaded and used by loading the default patch and using the Kontakt GUI to load presets, which you can then import into VIP and build your own plugin maps. Click on the arrow (>) next to the column headers to display currently unused tags and click on the plus (+) next to each column header to create your own tags. For more information on creating and organizing category tags, see our guide here. Looking for more assistance with VIP and your VIP-enabled controller? Check out the links below for more guides and tutorials!